WAMM'S approach to development is innovative and immersive. 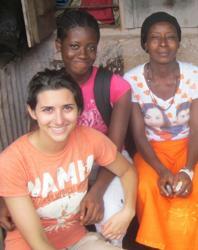 I wanted to be involved in work creating an actual impact in local West African communities. During my undergraduate experience at the University of Maryland I was involved with my campus's Engineers Without Borders group, where I developed a passion for nutrition development. Together with teams of students, we designed and implemented engineering development solutions in Burkina Faso, Peru, and Brazil. In my spare time I volunteered with an organization addressing national hunger issues and worked as a peer mentor. After graduating, I started on the track to become a Registered Dietitian, completing supervised practice requirements in clinical and community settings. We found that in Sammie Town, 64% of the people are food insecure, and 4% of people are severly food insecure. With household hunger at moderate and severe levels.